Wow. I don't know just what to say, except maybe that I am eternally thankful for having given so many Indian authors a try in the past year. I did not expect to like this book, but I suppose I shouldn't trust my biased expectations any more. It is a fabulous book. And it certainly won't be the last I read by the author. 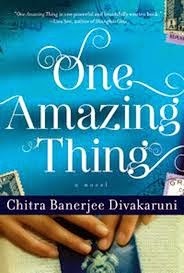 One Amazing Thing by Chitra Banerjee Divakaruni opens with Uma, a Medieval Lit student and someone I could instantly connect to, sitting in the lobby of the Indian Consulate Building, waiting to get her Visa done. It is dull and slow, the employees in no hurry to get things done on time, a typical Indian office maintaining its charm even in the middle of America. There are a number of people there, a Chinese woman and her granddaughter, an African American man, an old couple, the Indian staff and others. Everything is dull, that is, until an earthquake strikes and the group is trapped in the building, which soon becomes a suffocating cage and there's tension between the people. Then our heroine, the Literature buff with a copy of The Canterbury Tales in her bag has a predictably wonderful idea: telling each other stories to avoid panicking. Every story is the one life-altering experience each of them has ever had. The tales and the characterization are the essence of the book. From a love story set in Calcutta's Chinatown to an ex-soldier seeking redemption, the stories continue to thrill, touch and haunt you. Even as the building slowly starts to flood and crumble, you are sucked into the lives of the people and the panic and urgency is replaced by an odd hope. It is the last story and the ending that will decide your view of the book: Being enraptured throughout by the people's stories, I thought the ending was perfect. A stroll through Goodreads made me realize that many were actually disappointed by it! Hence this warning: if you like the focus to be on the plot, if you don't like short stories, if you need concrete explanations and conclusions; you may not like the meandering prose. The writing does become a bit too wordy at times. But the tales never lose their touch of mundane, regular, familiar. The book is simple and profound in its simplicity. The author manages to find magic in things that are ordinary, worldly. And she really makes you think: about your life, about the people in it and about that one amazing thing that you may have experienced. A beautiful book and definitely worth a read! Great review. I will definitely try this one out. Sure, I hope you like it! I really wanted to read her Palace of Illusions, which is apparently a retelling of the Mahabharata, but this was the one I found! Have you read anything by her? Seems to be a really interesting book. Thanks and surely will have finish reading this one before the end of the month. For passionate readers like you all,I came across a real-time marketplace, where we can buy / sell new or used books at the best price by bargaining online "www.mydeals247.com". Just have a look, you won't be disappointed. I love when a book takes me by surprise. Sounds like a read that sticks with you. I enjoyed this book a lot. Nice review. Thank you for following my blog; I appreciate it. Alexis - It is a very unique read and worth the time! Diane - You're welcome. Thanks for stopping by! I'm glad you enjoyed this book.